Constantly reminding me of what I love about anime. As soon as the OP music starts I have the biggest grin on my face. It was one of those animes I debated watching until there was around 5 episodes out then just went for it out of boredom and I cannot stress enough how glad I was that I did. I've never been one for sports anime, shamelessly to say it was the animu hasbando effect that drew me in the most, but I can easily say 43 episodes later that this is one of the best animes I've ever had the pleasure of watching and I'm so glad it exists. The combination of visually interesting characters, smooth animation and totally intense, compelling basketball is really what makes KnB so fantastic. I'm always left shocked with each 'power' unveiling. Even more shocked when the 20 minutes fly by in what feels like 20 seconds. It could be understandable to say that there are slight slow 'filler' periods, particularly throughout the first season, however I can't say that there's a single episode I haven't enjoyed. Anyone debating it or even skipping across it. STOP AND JUST WATCH IT. Lame Basketball Anime? THINK AGAIN BATMAN! I know what you're thinking. Sports anime? LAME! It has to be boring and played out so over dramatically and did I mention LAME?! HOLY BLEEP! What did I just watch?! I stayed up until 6AM watching every episode (1 to 13)! I even made this crunchyroll account just to write this review! Not only is the anime drawn well (and if you guys didn't notice, the basketball nets are animated not drawn), and you can't help but get pumped and cheer while watching the games, but the themes it uses are simple yet brilliant! I'm not even recommending you to watch it, I'm hyperbolically threatening you to watch it! You will be more than pleased! You don't have to like sports. Really exciting. You don't have to be a sports fan to enjoy this anime. I'm not into basketball. At. All. And sports/sports anime aren't my "thing." But I saw the reviews were really good, and I thought, "Eh, I'll give it a chance." I am so happy I gave it a chance after all. This is the only anime I can think of now (besides when I was like twelve or so), where I "fist pumped in the air with literal adrenaline rush" when a character I liked was victorious. I'm now several episodes into Season 2. If you decide to watch this anime, get past the very first episode. I wasn't addicted by the first episode, but afterwards I found myself unable to stop watching. I don't know how it will be for other people, but I can say for myself, usually a non-sports-anime-fan, that I'm really enjoying it. I have been avoiding this anime for quite a while, I thought it was boring ! in fact it is one of the best sport animations I have ever seen. The story is amazing! I watched all the episodes in 2 days. I really recommend it for people who like sports. It took me that extra bit of willpower to start this anime, but once I clicked play on that first episode, I could not stop. Within a few episodes, I could feel the adrenaline pumping and my heart rate rising. Simply waiting for the next episode to wait was so unbearable, that I decided to camp out on my sofa and marathon all of season 1, just in time for season 2. It was this anime that truly had the power to push me through my studies because it was not your typical "Good wins every time." Seeing Seirin and its members fight through all the struggles and still lose matches really connected with me, because there are countless times I studied with my all for a test, then received a result that was terrible. I sound really silly, but thinking back to certain quotes, like Kagami's "There's no such thing as useless effort!" and Kiyoshi's "If you wanna climb a mountain, you obviously aim for the top. But you gotta enjoy the scenery too" really pushed me on. I was so stoked about this anime that I got a few friends equally excited! Twelfth grade ended a month ago, and I got a really satisfying result. One of the reasons is this anime. I truly recommend it for a roller-coaster ride of motivation and inspiration! I was a bit skeptical at first, seeing as how the only anime I've watched and actually enjoyed being Free (swimming anime). But I wanted to try another sport out, and I didn't exactly hate basketball, I was neutral, but honestly after watching this show I have to admit it has become one of my favorite sports anime ever. The characters are absolutely entertaining and well done, the comedy is also a nice touch, the plot is also engaging, I can't find ONE thing I dislike about this anime. Not to mention the fundamentals are not so hard to grasp after a while of watching. With all that said some individual find or will find the game play is some what unrealistic for them and this is true to a certain extent but not entirely, How....to a person who has not played basketball in a somewhat professional manner or recognized team, it will appear unrealistic, but to those who have it is very close to reality, and this is where I bring the whole point of portrayal (or view), because professional or semi-professional Basketball players will understand that during the game when you are in the court, game-play such as dribbling seems very fast paced to you and things such as special moves appearing in slow motion, power moves and inner self dialog and analysis are going through your head and your brain views them in an extreme manner close as to what is portrayed in the Anime, but to the average onlooker outside with the untrained eye who is not under competitive pressure the game does not seem that out of the ordinary, and to them 'Kuroko's Basketball' will appear to have unrealistic game-play. Hence portrayal again comes into play, because the Anime (especially the Game play) is done through-out the eyes of a player in the field the actions appear superhuman or unrealistic to the viewers. So it all comes down to perception, the only real false attributes that are unrealistic is the Aura around the players at times and the excess sweat that seems to fly around of players like they carry around personal sprinklers but... HEY that's anime. The anime has great character development, and has the rare story telling ability of not always having the Main character's team as the victor in each game (including the important ones), Not simply centering on one main character through each episode, which is portrayed by some episodes following characters outside of the main characters team and having a significant number of episodes where the main characters are simply spectator in the crowd and while the attention is focused on other teams playing, this aspect of the Anime helps to give a sense of realism and practicality that helps in making the Anime more appealing and close to heart as the realistic downfall, failures and success of characters makes the viewer appreciate it more. The humor is timed perfectly and is kept in check and does not appear too forceful like some anime tend to do. The anime is also not filled with too much perverted fan-service which leave it unblemished of its seriousness. Kuroko's Basket ball is truly an Anime worth watching that keeps it real to high extent but not to the max to the point of making it overly serious because...Hey...It is still Anime after all. This show. This. Show. Sport animes in general are so much fun because they are realistic, yet fantastic. And by fantastic I mean that they flutter along the edge of fantasy, gleefully crossing the line into ridiculous more and more (and further and further). This show does a fantastic job at one-upping itself just when you think you couldn't laugh any harder or getting any closer to the edge of your seat. If a show about an athlete whose talent is essentially being ridiculously unnoticeable doesn't catch your attention, there's something wrong. I watched this entire show in less than 3 days because I just couldn't stop. I cannot wait for the next season! 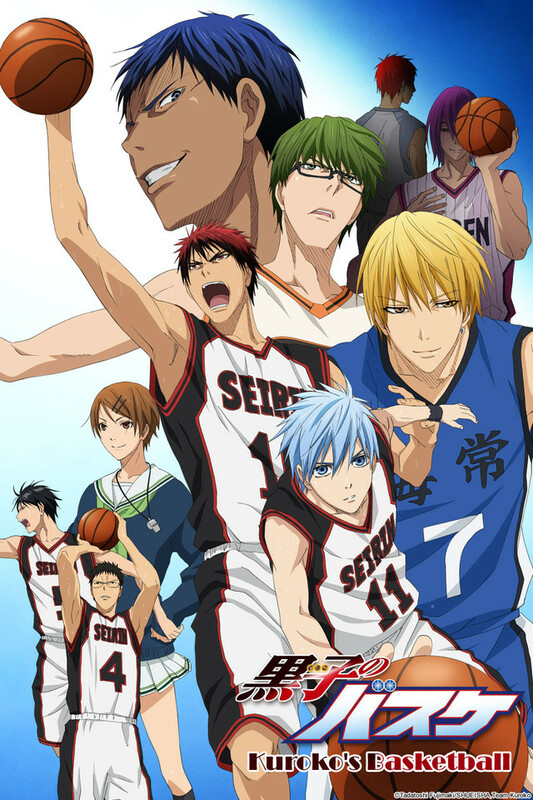 The best and most exhilarating sports anime series that I have ever seen... and I don't even watch basketball. For someone who has watched Captain Tsubasa (both versions), Slam Dunk!, Eyeshield 21, and many other great sport series, and NOT being a basketball fan at all myself, I have to say this is the best sports series I have seen. Soundtrack, characters, directing, opening and ending sequences, the animation (Production I.G). I could write for hours, but this is a series that you have to see, but most importantly, you must feel. Prepare for quite the adrenaline rush. The wait for Season 2 will be really painful. Masterful in almost every way.